Los Angeles’ gay interfaith power couple Stephen Friedman and Adam Granat took part in A Wider Bridge’s LGBTQ Mission to Israel and share their magic moments from the trip in this newly-released video. “At first I was a little freaked out about coming here to Israel, watching the news and not really having an opinion about Israel as a nation- I’m definitely glad that Adam pushed me to come,” says Stephen, who is not Jewish. “I think that the biggest impact that was made on me from this trip is meeting all of the religious LGBT community members, it showed me that I don’t have to sacrifice my traditionally conservative views with Judaism and practices to still be a strong person and LGBT and not lose any of my assents and who I am as a Jewish person,” says Adam. Participants on a wider bridge’s 2014 Israel Mission shared their magic moments from the trip. A Wider Bridge’s unique trip brings together an incredible and diverse group of leaders – lesbian, gay, bisexual, trans and queer (LGBTQ) people and allies, Jews and non-Jews. Through shared experience, participants engage with modern Israeli and LGBTQ life, and learn about both the recent and ancient history of the people, the land and the state of Israel. 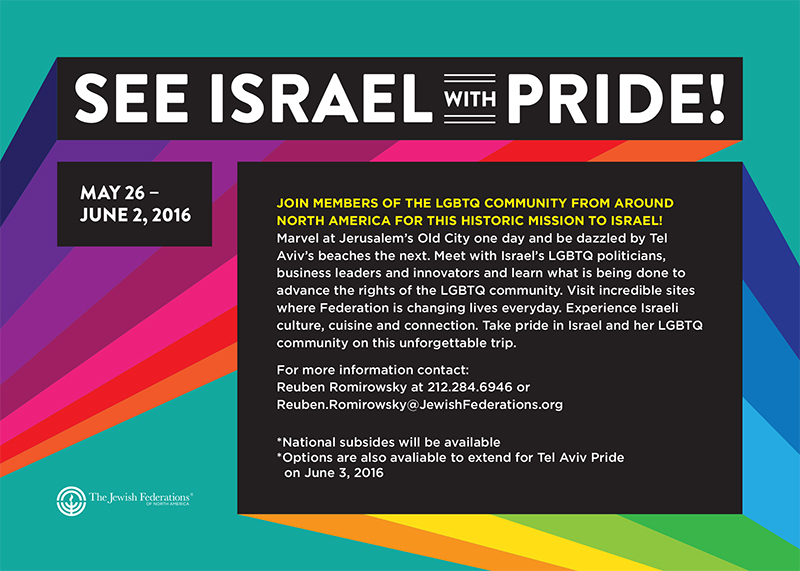 A Wider Bridge is proud to be collaborating with JFNA on developing the LGBTQ portions of the itinerary for the May 2016 Israel Mission trip.